Name Variation Mary Mercer was also known as Mareg. She was the daughter of Joseph Castard Mercer Sr and Anna Barbara Milliron. Mary Mercer died after December 1820. 7 August 1820 Plumcreek, Armstrong, Pennsylvania Mary Mercer was referenced on Joseph Castard Mercer Sr's household in the 1820 Census at Plumcreek, Armstrong, Pennsylvania; male age 10-15: 2, male over 45: 1, females under 10: 3, females 10-15: 1, females 16-25: 2, female 26-44: 1, person engaged in agriculture: 1. Name Variation Barbara Mercer was also known as Barbry. 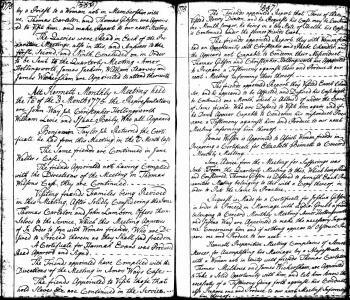 Married Name 26 December 1820 As of 26 December 1820,her married name was Nulph. 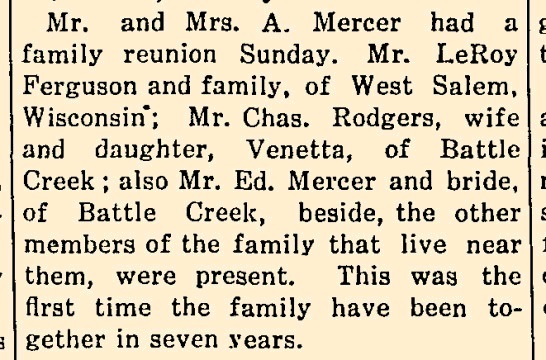 Barbara Mercer died on 3 October 1860 at 58y 7m 21d, Ringgold, Iowa, at age 57. She was buried after 3 October 1860 at Union (aka Mortimer) Cemetery, Jefferson Township, Ringgold, Iowa. 7 August 1820 Plumcreek, Armstrong, Pennsylvania Barbara Mercer was referenced on Joseph Castard Mercer Sr's household in the 1820 Census at Plumcreek, Armstrong, Pennsylvania; male age 10-15: 2, male over 45: 1, females under 10: 3, females 10-15: 1, females 16-25: 2, female 26-44: 1, person engaged in agriculture: 1. [S248] U.S. Federal Census 1860 U.S. Federal Census, by Ancestry.com, Page 66. Dwelling 540. Name Variation George Casper Nulph was also known as G. C.
Name Variation George Casper Nulph was also known as Nulf. George Casper Nulph was born on 6 April 1801 at Nescopec Township, Luzerne, Pennsylvania. He was the son of Casper Nulph Jr. and Eve Hetrick. George Casper Nulph died on 20 October 1878 at 77y 6m 17d at age 77. He was buried after 20 October 1878 at Union (aka Mortimer) Cemetery, Jefferson, Ringgold, Iowa. [S247] U.S. Federal Census 1870 U.S. Federal Census, by Ancestry.com, Page 6. Dwelling 48. William Mercer died after 1840. 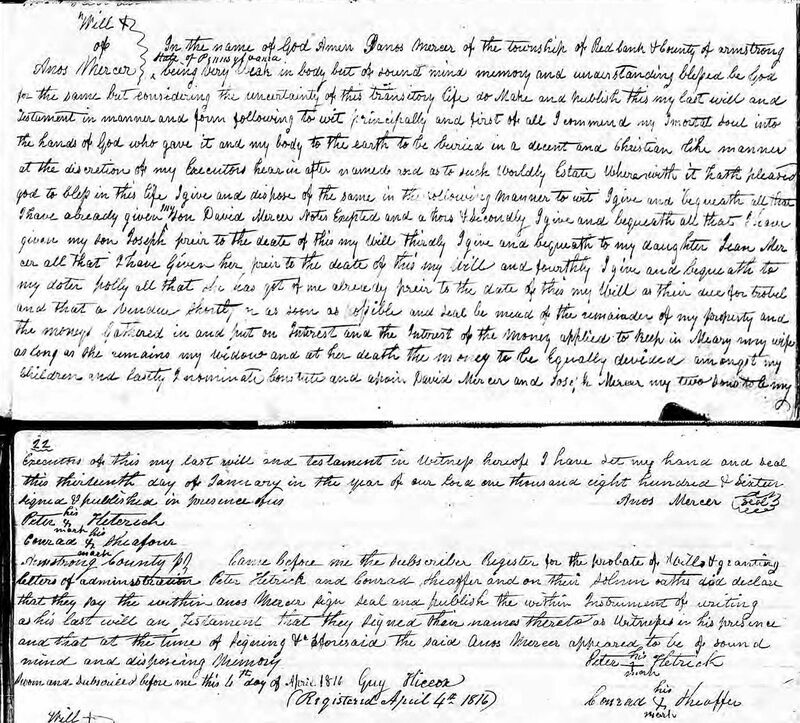 7 August 1820 Plumcreek, Armstrong, Pennsylvania William Mercer was referenced on Joseph Castard Mercer Sr's household in the 1820 Census at Plumcreek, Armstrong, Pennsylvania; male age 10-15: 2, male over 45: 1, females under 10: 3, females 10-15: 1, females 16-25: 2, female 26-44: 1, person engaged in agriculture: 1. 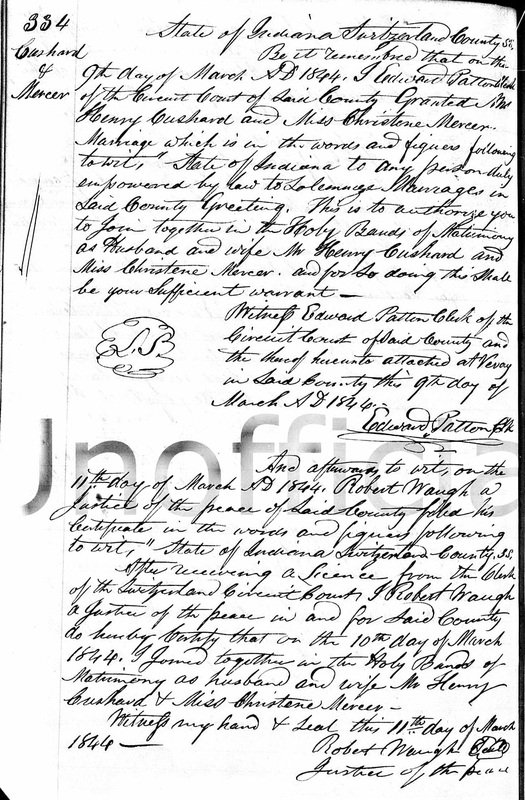 [S332] Indiana Marriage Records, by Indiana. Name Variation Arabella Scott was also known as Arabela. Name Variation Arabella Scott was also known as Isabel. 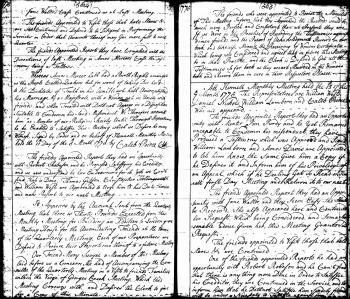 Married Name 12 January 1839 As of 12 January 1839,her married name was Mercer. Arabella Scott was born circa 1805. Arabella Scott died after 1840. Jane Mercer died before 1849. 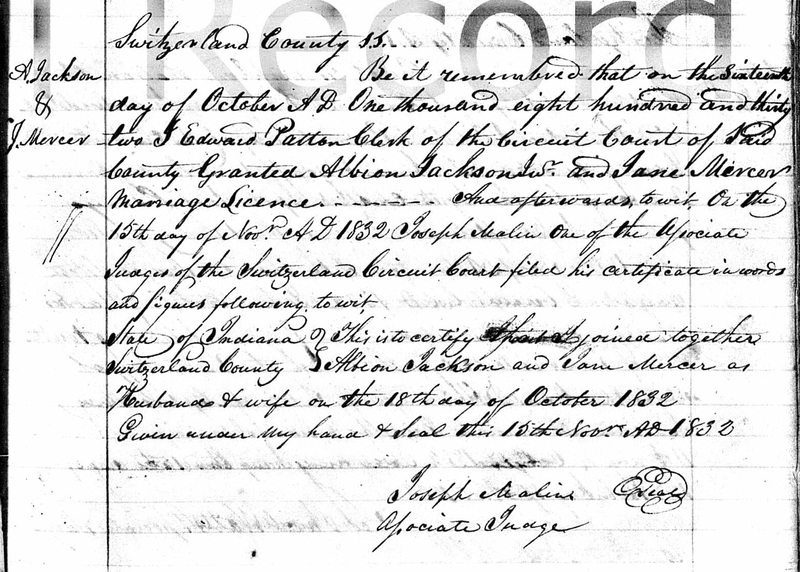 7 August 1820 Plumcreek, Armstrong, Pennsylvania Jane Mercer was referenced on Joseph Castard Mercer Sr's household in the 1820 Census at Plumcreek, Armstrong, Pennsylvania; male age 10-15: 2, male over 45: 1, females under 10: 3, females 10-15: 1, females 16-25: 2, female 26-44: 1, person engaged in agriculture: 1. 1840 York, Switzerland, Indiana Jane Mercer was referenced on Albion Jackson Jr's household in the 1840 Census at York, Switzerland, Indiana; 1 male age 15-20, 1 male age 30-40; 1 female age 20-30, 2 female between age 5-10, 2 female under age 5. Jane Mercer migrated in 1848 at Vevay, Indiana. Name Variation Albion Jackson Jr was also known as Alvin. Name Variation Albion Jackson Jr was also known as Alben. Name Variation Albion Jackson Jr was also known as Albian. Albion Jackson Jr was born circa 1809 at New York. He was the son of Albion Jackson Sr. and Sarah Shew. Albion Jackson Jr married Delila Bowan on 5 July 1849 at Indiana. Albion Jackson Jr died before 1880. 1840 York, Switzerland, Indiana Albion Jackson Jr was listed as the head of a family on the 1840 Census at York, Switzerland, Indiana, 1 male age 15-20, 1 male age 30-40; 1 female age 20-30, 2 female between age 5-10, 2 female under age 5. Albion Jackson Jr migrated in 1848 at Vevay, Indiana. [S249] U.S. Federal Census 1850 U.S. Federal Census, by Ancestry.com, Dwelling 183. Name Variation Eve Mercer was also known as Eva. Eve Mercer died after November 1840. 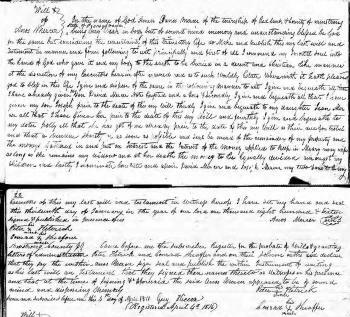 7 August 1820 Plumcreek, Armstrong, Pennsylvania Eve Mercer was referenced on Joseph Castard Mercer Sr's household in the 1820 Census at Plumcreek, Armstrong, Pennsylvania; male age 10-15: 2, male over 45: 1, females under 10: 3, females 10-15: 1, females 16-25: 2, female 26-44: 1, person engaged in agriculture: 1. John Harker was born circa 1812. Name Variation Margaret Mercer was also known as Margrat. 7 August 1820 Plumcreek, Armstrong, Pennsylvania Margaret Mercer was referenced on Joseph Castard Mercer Sr's household in the 1820 Census at Plumcreek, Armstrong, Pennsylvania; male age 10-15: 2, male over 45: 1, females under 10: 3, females 10-15: 1, females 16-25: 2, female 26-44: 1, person engaged in agriculture: 1. Name Variation Susanna Mercer was also known as Susana. Nickname Susanna Mercer also went by the name of Susan. Married Name after 1850 As of after 1850,her married name was Gethards. Susanna Mercer married (?) Gethards after 1850. Susanna Mercer died after 1850. 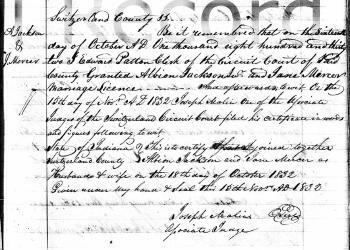 7 August 1820 Plumcreek, Armstrong, Pennsylvania Susanna Mercer was referenced on Joseph Castard Mercer Sr's household in the 1820 Census at Plumcreek, Armstrong, Pennsylvania; male age 10-15: 2, male over 45: 1, females under 10: 3, females 10-15: 1, females 16-25: 2, female 26-44: 1, person engaged in agriculture: 1. [S249] U.S. Federal Census 1850 U.S. Federal Census, by Ancestry.com, Stamp 378. Dwelling 397. (?) Gethards was born circa 1818. He married Susanna Mercer, daughter of Joseph Castard Mercer Sr and Anna Barbara Milliron, after 1850. Name Variation Christina Mercer was also known as Christine. Christina Mercer died on 24 November 1908 at age 86. She was buried after 24 November 1908 at Wallingford Cemetery, Flemingsburg, Fleming, Kentucky. Christina Mercer had 9 with 5 living in 1900 children. [S248] U.S. Federal Census 1860 U.S. Federal Census, by Ancestry.com, Stamp 665. Dwelling 1108. [S247] U.S. Federal Census 1870 U.S. Federal Census, by Ancestry.com, Page 12. Dwelling 88. 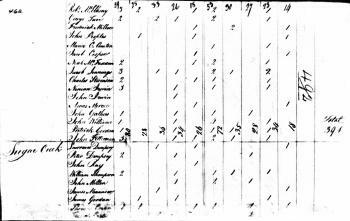 [S246] U.S. Federal Census 1880 U.S. Federal Census, by Ancestry.com, NA Film Number T9-0438. Page 396D. ED161. Dwelling 34. [S245] U.S. Federal Census 1900 U.S. Federal Census, by Ancestry.com, Year: 1900; Census Place: Magisterial District 3, Fleming, Kentucky; Roll: 520; Page: 19B; Enumeration District: 0040; FHL microfilm: 1240520. Name Variation Henry Cushard was also known as John Henry. 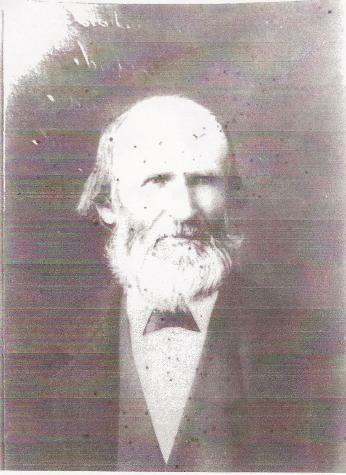 Henry Cushard was born in 1809 at Ohio also reported as circa 1815. He was the son of Peter William Cushard Sr. and Catherine (?). Henry Cushard died on 18 April 1899. He was buried after 18 April 1899 at Wallingford Cemetery, Flemingsburg, Fleming, Kentucky. Stephen White was born circa 1786 at Massachusetts. He married Orpha Mary Howe, daughter of Amasa Howe and Sarah Harrington, in 1811 at Rutland, Rutland, Vermont. Stephen White died in 1848 at Rising Sun, Indiana. Name Variation Orpha Mary Howe was also known as Mary. Married Name 1811 As of 1811,her married name was White. Orpha Mary Howe was born on 30 June 1791 at Rutland, Rutland, Vermont. She was the daughter of Amasa Howe and Sarah Harrington. Orpha Mary Howe married Stephen White in 1811 at Rutland, Rutland, Vermont. Orpha Mary Howe died on 16 April 1864 at Danville, Vermilion, Illinois, at age 72. [S248] U.S. Federal Census 1860 U.S. Federal Census, by Ancestry.com, Year: 1860; Census Place: Township 19 N Range 9 E, Champaign, Illinois; Roll: M653_160; Page: 442; Image: 443; Family History Library Film: 803160. Name Variation Amosa Harrington Mercer was also known as Amos Harrington. Name Variation Amosa Harrington Mercer was also known as Amasa H.
Name Variation Amosa Harrington Mercer was also known as A. H.
Nickname Amosa Harrington Mercer also went by the name of Herbert. Amosa Harrington Mercer was born at Grant, Indiana, on 30 July 1832. 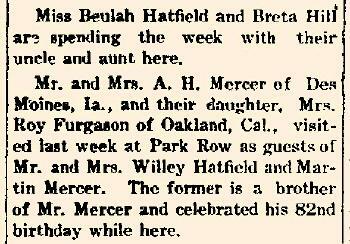 Amosa Harrington Mercer, as the father of the bride, attended the wedding of Ray B. Ferguson and Ella K. Mercer on 1 October 1902 at home of the bride's parents, Rippey, Greene, Iowa; Ella Mercer and Ray Ferguson marriage announcement. Amosa Harrington Mercer died on 30 June 1921 at Rippey, Washington Twp, Greene, Iowa, at age 88; also reported as 4 Apr 1921. He was buried after 30 June 1921 at Rippey Cemetery, Rippey, Greene, Iowa. 1895 Iowa State Census, Rippey Town, Greene, Iowa He appeared on the census of 1895 at Iowa State Census, Rippey Town, Greene, Iowa. 1905 Rippey, Washington, Greene, Iowa He appeared on the census of 1905 at Rippey, Washington, Greene, Iowa. 1915 Rippey, Greene, Iowa He and Ellen Connie Flora appeared on the census of 1915 at Rippey, Greene, Iowa. In September 1907 Amosa Harrington family reunion. In July 1913 at Park Row, Iowa, Mr and Mrs A H Mercer and daughter visited his brother Martin and niece Mrs Willey Hatfield. [S186] Illinois, Illinois Statewide Marriage Index, volume D. Page 337. [S235] Iowa Marriages 1851-1900 Marriages, by Iowa, listed as Claus E. Rogers. [S246] U.S. Federal Census 1880 U.S. Federal Census, by Ancestry.com, ED269. Page 18. Dwelling 154. [S245] U.S. Federal Census 1900 U.S. Federal Census, by Ancestry.com, Dwelling 99. ED97. [S244] U.S. Federal Census 1910 U.S. Federal Census, by Ancestry.com, ED106. Dwelling 38. [S243] U.S. Federal Census 1920 U.S. Federal Census, by Ancestry.com, ED118. Dwelling 98. Name Variation Martin VanBuren Mercer was also known as Martin G.
Martin VanBuren Mercer was born on 24 October 1833 at Indiana or Ohio. Martin VanBuren Mercer died on 26 September 1922 at Correctionville, Woodbury, Iowa, at age 88. He was buried after 26 September 1922 at Correctionville Cemetery, Correctionville, Woodbury, Iowa. 1885 Rock, Woodbury, Iowa He appeared on the census of 1885 at Rock, Woodbury, Iowa. 1895 Correctionville, Woodbury, Iowa He appeared on the census of 1895 at Correctionville, Woodbury, Iowa. 1915 Rutland, Woodbury, Iowa He appeared on the census of 1915 at Rutland, Woodbury, Iowa. [S186] Illinois, Illinois Statewide Marriage Index, volume C. page 332. [S186] Illinois, Illinois Statewide Marriage Index, volume C. page 334. [S247] U.S. Federal Census 1870 U.S. Federal Census, by Ancestry.com, Page 1. Dwelling 1. [S243] U.S. Federal Census 1920 U.S. Federal Census, by Ancestry.com, ED193. Dwelling 188. Name Variation Harriet Adela Herrick was also known as Hearrick. Name Variation Harriet Adela Herrick was also known as Hattie. Married Name 26 August 1862 As of 26 August 1862,her married name was Mercer. 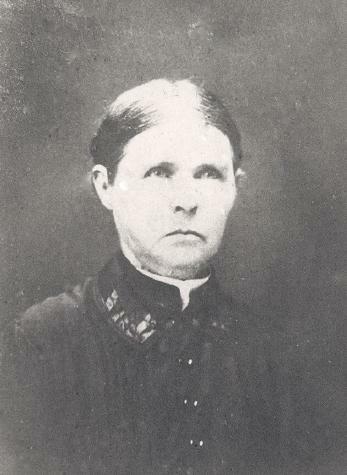 Harriet Adela Herrick was born on 8 August 1843 at Patriot, Indiana, also reported as Aug 1845. She was the daughter of James A. Herrick and Sarah A. (?). 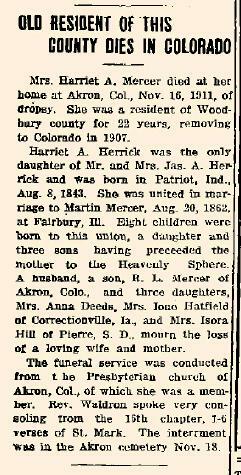 Harriet Adela Herrick died on 16 November 1911 at Akron, Colorado, at age 68 Harriet Adela (Herrick) Mercer obituary. 1885 Rock, Woodbury, Iowa Harriet Adela Herrick appeared on the census of 1885 in the household of Martin VanBuren Mercer at Rock, Woodbury, Iowa. 1895 Correctionville, Woodbury, Iowa Harriet Adela Herrick appeared on the census of 1895 in the household of Martin VanBuren Mercer at Correctionville, Woodbury, Iowa. Harriet Adela Herrick had 8 with 4 living in 1900 children. She had 8 with 4 living in 1910 children. [S249] U.S. Federal Census 1850 U.S. Federal Census, by Ancestry.com, Dwelling 555. [S248] U.S. Federal Census 1860 U.S. Federal Census, by Ancestry.com, Page 293. Dwelling 2056. William Green Mercer was born on 25 August 1835 at Marion, Marion, Indiana. In 1903 excluded from the will of his mother due to "whose whereabouts is unknown for the last thirty years". John Howe Mercer was born on 4 March 1837 at Indiana also reported as Ohio. John Howe Mercer died between 1930 and 1935. [S186] Illinois, Illinois Statewide Marriage Index, Volume 2 / Page 375. [S247] U.S. Federal Census 1870 U.S. Federal Census, by Ancestry.com, Page 6. Dwelling 56. [S246] U.S. Federal Census 1880 U.S. Federal Census, by Ancestry.com, NA Film Number T9-0226 Page Number 374C. [S243] U.S. Federal Census 1920 U.S. Federal Census, by Ancestry.com, ED151. Dwelling 15. [S250] U.S. Federal Census 1930 U.S. Federal Census, by Ancestry.com, Year: 1930; Census Place: Terre Haute, Vigo, Indiana; Roll: 635; Page: 3B; Enumeration District: 32; Image: 437.0; FHL microfilm: 2340370. Name Variation Ephriam Mercer was also known as Ephraham. Ephriam Mercer was born at Ohio on 17 March 1841. Ephriam Mercer died on 24 October 1861 at Rolla, Phelps, Missouri, at age 20 He died in Rolo, Missouri during the Civil War, probably of typhoid fever. He had started study to be a doctor. Ephriam Mercer began military service before October 1861 Batallion 25, Illinois infantry. Henry Mercer was born at Illinois in 1842. Henry Mercer died before December 1849. Married Name 31 October 1863 As of 31 October 1863,her married name was Johnson. Sarah Ann Mercer was born at Indiana on 2 August 1843. Sarah Ann Mercer died on 9 July 1917 at Old Urbana, Champaign, Illinois, at age 73 Also reported as Lone Rock, Wisconsin. Sarah Ann Mercer had 3 with 2 living in 1900 children. [S186] Illinois, Illinois Statewide Marriage Index, Volume 2, page 508. [S246] U.S. Federal Census 1880 U.S. Federal Census, by Ancestry.com, ED99. Page 10. Dwelling 94. [S245] U.S. Federal Census 1900 U.S. Federal Census, by Ancestry.com, ED110. Dwelling 74. David E. C. Johnson was born in March 1839 at New York. He was the son of Thomas Johnson. [S248] U.S. Federal Census 1860 U.S. Federal Census, by Ancestry.com, Page 62. Dwelling 459. Married Name circa 1866 As of circa 1866,her married name was Roberts. Eliza B. Mercer was born at Indiana on 28 October 1845. Eliza B. Mercer married Ellwood B. Roberts circa 1866. Eliza B. Mercer died after 1930. Eliza B. Mercer had 3 with 3 living in 1900 children. 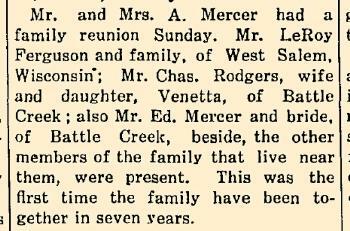 She lived in 1903 at Redfield, Spink, South Dakota, location listed in probate records for Adah Miranda Mercer. She had 3 with 3 living in 1910 children. [S245] U.S. Federal Census 1900 U.S. Federal Census, by Ancestry.com, Year: 1900; Census Place: Rock, Woodbury, Iowa; Roll: 466; Page: 2A; Enumeration District: 0160; FHL microfilm: 1240466. [S244] U.S. Federal Census 1910 U.S. Federal Census, by Ancestry.com, Year: 1910; Census Place: Redfield Ward 4, Spink, South Dakota; Roll: T624_1488; Page: 11A; Enumeration District: 0400; FHL microfilm: 1375501. [S243] U.S. Federal Census 1920 U.S. Federal Census, by Ancestry.com, Year: 1920; Census Place: Salem, McCook, South Dakota; Roll: T625_1723; Page: 5A; Enumeration District: 155. Robert Mercer Jr was born at Indiana on 22 June 1847. Robert Mercer Jr married Emily Carter, daughter of Zephainah Carter and Francis (? ), circa 1868. Robert Mercer Jr died after June 1900. [S247] U.S. Federal Census 1870 U.S. Federal Census, by Ancestry.com, Year: 1870; Census Place: Jackson, Madison, Iowa; Roll: M593_407; Page: 36B; Image: 76; Family History Library Film: 545906. [S245] U.S. Federal Census 1900 U.S. Federal Census, by Ancestry.com, Year: 1900; Census Place: Corwin, Ida, Iowa; Roll: 437; Page: 15B; Enumeration District: 0043; FHL microfilm: 1240437. Henry Mercer was born on 4 December 1849 at Tolona, Illinois, also reported as Indiana. 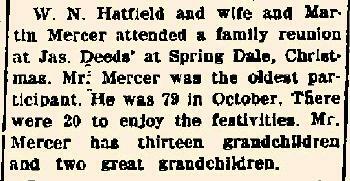 Henry Mercer died on 21 November 1862 at age 12 also reported as 1864. 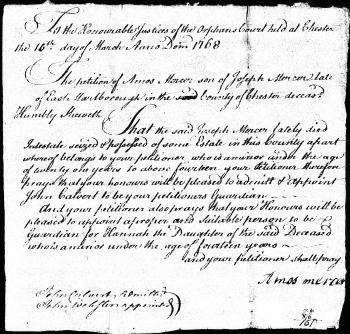 Amos Mercer was born on 8 March 1755 at East Marlborough Twp, Chester, Pennsylvania. He was the son of Joseph Mercer and Jane Swayne. 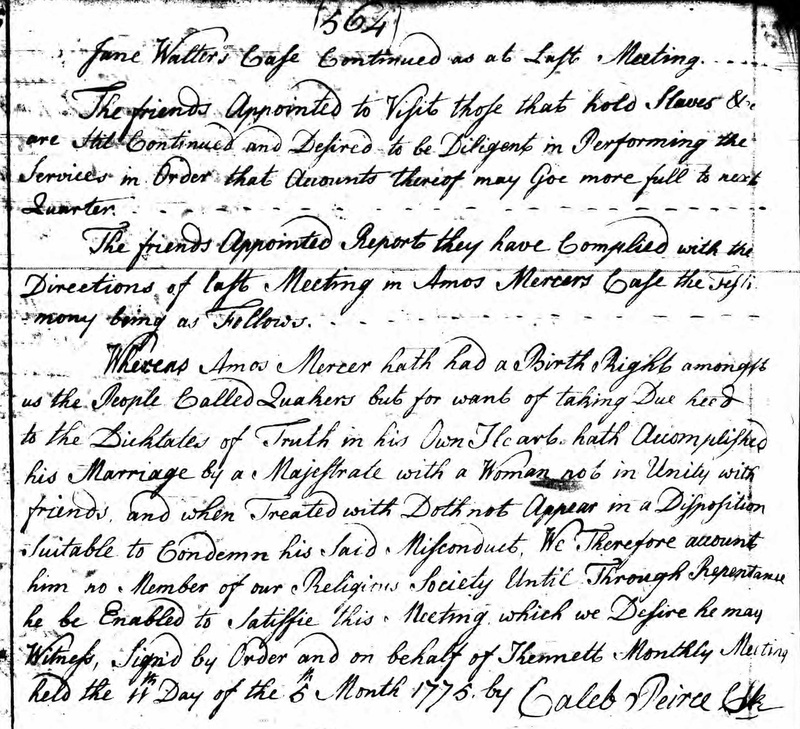 Amos Mercer married Mary Mitchell Barnes, daughter of James Enid Barnes and Elizabeth Mitchell Lindley, on 6 March 1775 at Chester, Pennsylvania, also reported as 16 Mar 1775. Amos Mercer died in April 1816 at Redbank Twp, Armstrong, Pennsylvania, at age 61. Number of Household Members: 7. 1800 Wheatfield, Westmoreland, Pennsylvania He was listed as the head of a family on the 1800 Census at Wheatfield, Westmoreland, Pennsylvania, surname listed as Meser; living next door to Joseph Meser (Mercer); Free White Persons - Males - 16 thru 25: 2; Free White Persons - Males - 45 and over: 1; Free White Persons - Females - 10 thru 15: 2; Free White Persons - Females - 45 and over: 1. 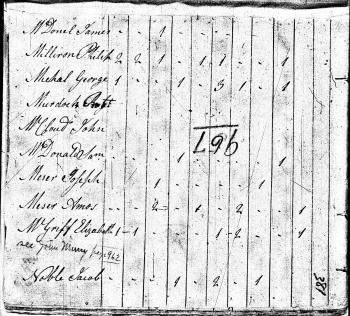 1810 Cherry Tree Township (Sugar Creek), Venango, Pennsylvania He was listed as the head of a family on the 1810 Census at Cherry Tree Township (Sugar Creek), Venango, Pennsylvania, 1810 Census page 462: Mercer, Amos - 1 free white male 45 & older, 1 free white female 45 & older. Amos Mercer was a veteran of the Revolutionary War. Rank: PRIVATE Service Source: PA ARCH 5TH SER VOL 6 P 245 Service Description: 1) CAPT JOHN WILLIAMS, 2ND CLASS 4TH BTTN 2) CUMBERLAND CO,MIL. "Amos Mercer served in the Revolution with the Cumberland County, Pennsylvania, Militia as a private soldier in Lieutenant Graham's Company of the 4th Battalion Colonel James Wilson, 1777." 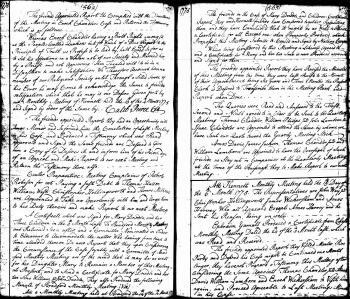 On 20 December 1763 According to Orphan's Court records, John Calvert married Jane Swayne Mercer and became guardian of the two living Mercer children, Amos and Hannah. 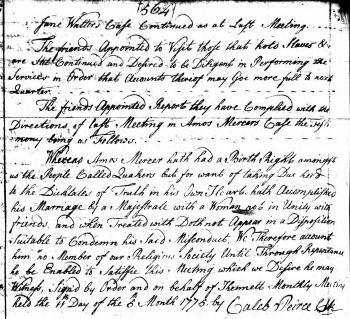 On 11 May 1775 Amos was reared as a Quaker but was expelled for taking part in the Revolution and marrying one that was not a member. Amos Mercer was Quaker but Amos was forced out of the Quaker religion because he married Mary Barnes in 1775. 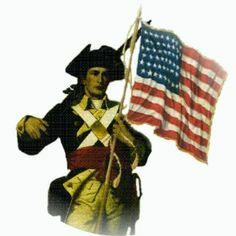 He began military service on 6 September 1777 at Private Second Class in First Company of the Fourth Battalion, Greenwood, Cumberland, Pennsylvania, Commander: Captain John Fouts; Amos Mercer served in the Revolution with the Cumberland County, Pennsylvania, Militia as a private soldier in Lieutenant Graham's company of the 4th Battalion, Colonel James Wilson, 1777. 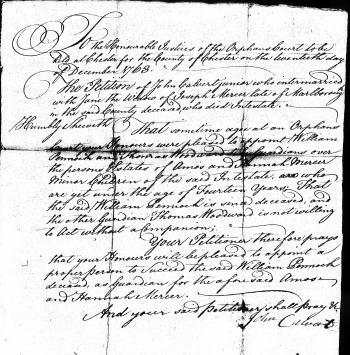 He left a will on 13 January 1816 at Redbank Township, Armstrong County, Pennsylvania, Will Book No. 1, Page 21, Armstrong County, Pennsylvania.